Experiencing the National Park by hiking through it will give you an amazing perspective and a lot of satisfaction. You will walk away fulfilled and happy. 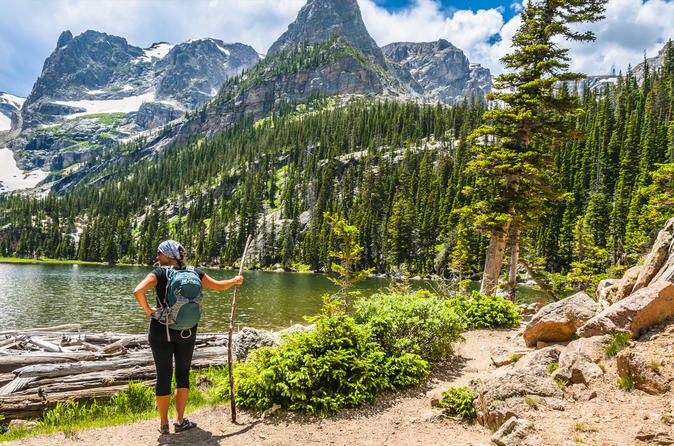 This is a spectacular moderate hike in Rocky Mountain National Park with a local guide that will make you feel safe. Stunning scenery, peaks, wildlife, and alpine lakes. Wildlife including elk, big horn sheep, deer, eagles, are often seen along the way. A truly amazing way to get out in nature and to feel like you are a world away. This tour can pick-up in Boulder as well. Call us for details. Drive from Denver to Estes Park into Rocky Mountain National Park. On the drive to the park you will pass historic towns and beautiful landscapes from Denver through Boulder, with the option to stop in Lyons for coffee etc. The hike has beautiful scenery, alpine lakes and diverse trails. The trail is framed with pine and aspen trees, with views of mountain ranges all around. Immerse yourself in the mountains away from it all. Have a tasty picnic lunch surrounded by serene nature. See Colorado’s famous continental divide – rivers and streams west of the divide flow to the Pacific Ocean and east of the divide to the Gulf of Mexico. This is a approx 3.5 mile trail with about 800 feet in elevation gain.